Anyway, I love the art, I love the story portion, and I love the cooperation aspect of the game. I won't say that I was fully submerged in the theme, but the way the game looks and feel does bring out that I am a mice in an otherworldly universe. The game is supposed to be easy to learn but hell it was hard for me - at first. Knowing when to move the chapter marker, when and where I can or cannot search, water movement, I just hate nitty gritty rules in games. I wish things were more straightforward so that I being the host can play and not sit in front of the game with the rulebook. I shall discuss the bad luck first. I was dead weight. Whole chapter. 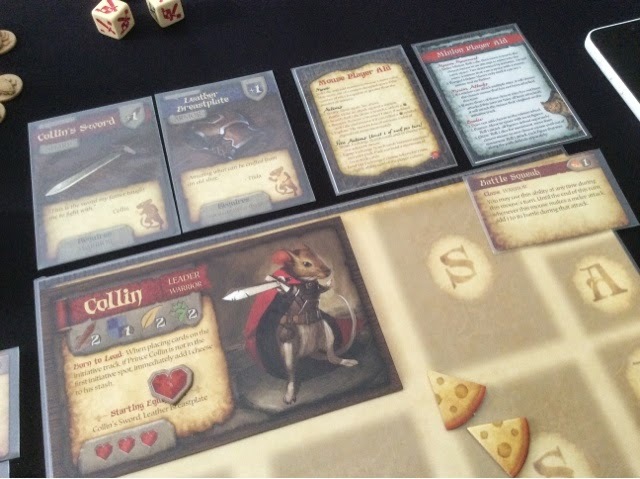 My melee Collin kept rolling ranged attacks, my ranged Maginos kept rolling melee attacks. I switched dice, same results. It was borderline frustrating. I was the only ranged character, so when they relied on me to shoot the enemy from across the water, I failed - countless times. It was more efficient to jump into the water, head to the other side, kill the enemy, jump back into the water, and move on ahead. That was our pathetic state of affairs. This really did sour me slightly on the game. I know its bad luck, but I think I would have wanted a way to improve stats so that I can roll more dice or get rerolls or something. Anyway, that was problem 1. Problem 2 was predictability. The tiles are small, so you generally could move from one end to the other in 1 or 2 moves maximum. This gave us little to really plan. You just step up to the plate, and bash the hell out of anyone that comes in your way. You can't really flank, or team up, just hope you are first in initiative order so that you receive less damage. The later chapters might be better but that was my chapter 1 experience. I would have liked things to be more open. Problem 3 was that the system could be gamed. You don't really want to kill all the enemies too quickly if not the enemies will advance on the cheese wheel which then triggers the advancement of the time in the game (which is a bad thing). So you could, and we did, use one mouse to tank some attacks from the last remaining enemy so that the other mice could move closer to the exit or search for stuff. This felt slightly wrong to me. It may be a strategy so to speak, but, some of the enemies are so weak that you just needed someone with a relatively high defense to help buy time and allow the others to execute some searching and using healing abilities. So that didn't sit well with me. Yup. Well, we won chapter 1 - barely. We were like, 2 cheeses or 1 captured mouse away from running out of time. I liked my play somewhat, I think it would have been a good session if I didn't have to keep referring to the rules, that would have given me time to enjoy the experience more. That being said, I wasn't that eager to jump into chapter 2 immediately. I would like to adventure in again sometime, but one of my two friends was not very enthralled by it. He said it was boring. The other friend (the one with D&D experience) liked it quite a bit and offered to buy it if I were selling it. I might have to carry on with chapter 2 with my other friend, just the two of us, and that would be ok with me. Just that I think the experience was not as wonderful as I hoped it would be. A solo play on my end might be in place so that I can see if I missed anything out, but that is a story for another day. I was not expecting to buy this game. I placed it into my cart only to get free delivery from Hobby Games Mart. It was pretty affordable (though I did buy two copies) and I heard some good buzz about it so I thought, heck, why not. Anyway, I've played it quite a bit since I got it - 7 times to be exact. I've played it only with 2 and 3 players, so I can't comment on how a 4 player game goes. Well, to back up a bit, the buzz I got from this game was from 2 sources - first, a reviewer on BGG said that it might be the best deckbuilding game out in the market currently (such a bold claim! ), second, Joel Eddy was sprouting high praise for it. Yup, so, best deck builder in the market you say? For real? There's like, a kazillion of them and a few really good ones out there in the top 200. I was obviously skeptical. I'm not a big deck building fan; I only own Legendary. Well, I will say that Star Realms is pretty darn good. I'm definitely keeping it for the near future. It resembles more of Ascension and Legendary than it does Dominion or Thunderstone. It utilizes the same buy from a row of cards in the middle of the table, and it has the same faction enhancing abilities that is found in Legendary. But apart from that, it steps out on its own with its ability to attack your opponents directly. What a horrible picture. But anyway, those were my bases as the boss. Fully protected. Star Realms has possibly the highest amount of interaction I have experienced in a deck building game. You buy cards and bases solely to mess with your opponent. That's it. Beat them, squash them, gloat over their dead floating junk of a carcass. You can either buy ships that are fleeting (haha) or you can buy bases. The ships come out, attack, get discarded, and you pray they come out real soon again. The bases on the other hand provide you with ongoing abilities and some of them help to give you immediate (highly required) protection. The other important thing about bases is that they give you an ally symbol you can rely on (until its destroyed). Don't overlook that! Games of Star Realms are fast and smooth. I have had 2 player games done in 20mins flat. Fast but highly rewarding. Joel loves the raid mode and I must say it seems promising. I played it twice but forgot that the bases accumulate damage through the players' turns, we didn't play it that way and the boss totally swiped the raiders aside. I am looking forward to playing it right, though I am miffed that I missed that rule out. Seriously. The raid rules is barely one paragraph long. 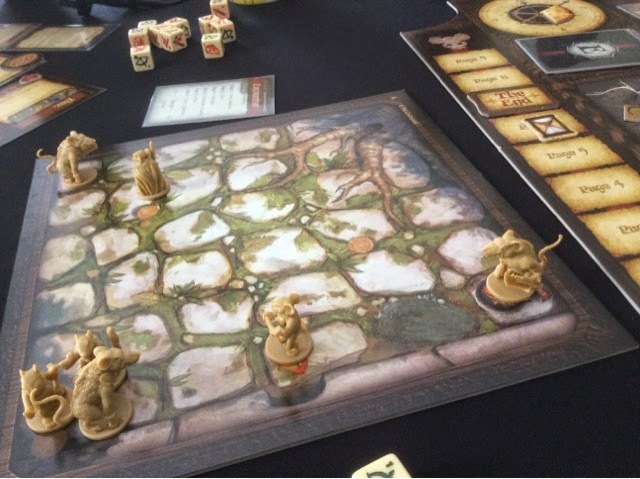 That is what you get after reading 2 hours of Mice and Mystics rules. Overall, Star Realms was a most rewarding purchase and I hope that it will get expanded at least once. Too many and it may make the game overly fiddly and complicated. I'm not certain how the game balances out when I mix the 2 decks for a 2 player game, but I really don't care. I'm just too darn lazy to split them up time and time again. I can't say if my 2 friends like it, they seemed rather ok about it only, but well, maybe with more plays they will come to or maybe I'm just spoiling them with many other great games. 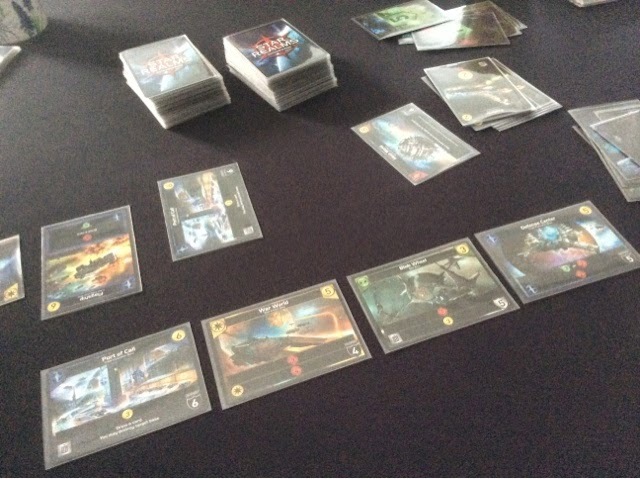 Splendor came with my purchase of Star Realms, and I have played it 8 times since then. That's a lot, and also very rare. Splendor is a very straightforward engine building game. Take resources (gems) on your turn, turn them in for cards that help you buy more cards and race till someone reaches 15 points by buying high valued cards or by attracting the interest of nobles who like people with specific colors of gems. That's it. Simple to teach and easy to jump into. Well, I will say this upfront, I find the game addictive. That's the best I can use to describe it. I'm finding it hard to describe how I feel about Splendor; it sends my mind funny signals. I keep playing it over and over again, but its not because its stupendously fun. When I play it, I don't feel like I am having a great ton of fun. I'm just waiting for my turn to see what I can do and hope that no one takes the card that I want. But that's it. I would go so far as to say that sometimes I find it boring - but I can't stop playing it! It's got the kind of addictive feel where you know you can do better, you can win now (if you lost previously), and you can just push your score to the required limit faster the next time round. That's the key. You feel you want to play it again immediately, but I can't tell you why I feel that way. Of my 8 games of Splendor, this is the hardest starting card draw. All multiples, nothing came easy. I don't sit there thinking that it is so different and unique, nor do I think it is exciting in anyway. The mood is often quiet with everyone staring at the cards, with some groans when a card that is wanted is taken away. But that's about as exciting as it gets. It's like a puzzle that you don't want others to mess up. But it is not in any way very fun, or tense, or rewarding. I just sit there and execute my game plan and wait till someone wins. Will I play it again? Yes! Play it now? Yes! Keep it? Yes! Why? Don't know. Its just one of those strange unexplainable things. I had more emotion playing Mice and Mystics and Star Realms, but this one is on equal footing in my eyes with both the games and yet there's no reason why it should. One of those things people. That's all I can say. I've played Splendor as a 2 and 3 player game, and never once did we not say play again. It works great on both counts and I'm surprised that my 2 friends though better of this than Star Realms. They are the space type of people and this was taken out as a social experiment on my end, to see how they would react to this. Haha. The things I do to amuse myself, but well, they liked it. The games were close and the finish was down to the last card draw. A lucky draw and a victory for me. Splendor is quite tense for me and my wife while we look on and mess up each other's plan, and we enjoy it very much and it plays quite smoothly. I look forward to playing 4 players to see how this turns out. Have you played the Builders yet? 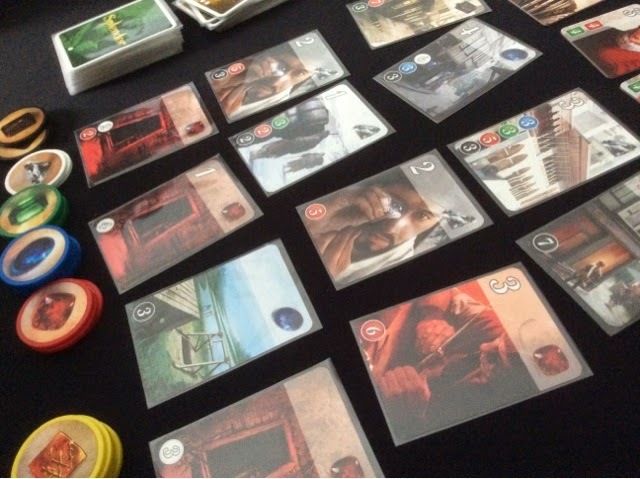 We played it last night and can't help but compare Splendor and the Builders. My wife seems to like the Builders more because it's more challenging for her. I am interested to try but its not the highest on my priority list. I am much more excited to get my copy of Port Royal on the table. Maybe this Saturday! Yah I lost the last round because my wife swiped all the resource while I was trying to push my luck with reserving. Anyway, I bought that copy of Builders! If you are keen, I can borrow you my copy. And oh I wanted to ask you where you get your Sansoucci and Port Royal from. I want to ship some Pegasus Spiele games from Amazon.de but got blocked. I think Ravensburger is going to distribute the multilingual version in US soon, so maybe I will wait for Amazon for that. Splendor works fine with many players though its probably more easier to get your plans screwed up because your cards get taken. So reserve action will be more important.